I felt at home as soon as I stepped off the plane in Ghana. I was met at the airport by Work the World and taken back to the house the next day to meet the other students and get settled in. Over the next couple of days I got to know the area, had both my hospital and clinic orientation and was shown around the town. I started my elective with two weeks at a small but busy maternity clinic in Takoradi, about 5 minutes drive from the house. It’s reasonably basic, with no running water, but staffed by some great midwives. There’s a hectic antenatal clinic that runs every day, seeing hundreds of women for routine antenatal care – not that much different from a clinic in the UK. Women would all wait together to be seen by one midwife. They would be weighed, have their blood pressure checked and urine dipped to check for protein and then move to another room for a midwife to listen to the foetal heart and discuss any problems the woman is having. I was pleased to find that all women are given iron tablets as most have a low Hb which puts them at a higher risk of haemorrhaging after delivery. The most obvious difference between Ghanaian and UK maternity care is that in Ghana labouring women stay in the same room as each other, moving to a delivery room when they are fully dilated for the birth. Jemima has a 3 bedded labour room and a delivery room, and 3 postnatal beds as well as a theatre for c-sections and a ward for those recovering from caesareans. In my two weeks I saw about 4 normal deliveries and a caesarean. 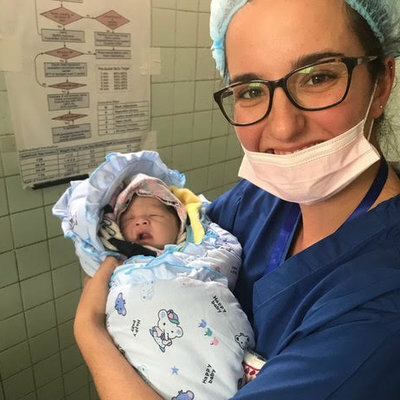 The theatre team is much smaller at a c-section than in the UK, with only a doctor, an anaesthetist, a scrub nurse and a runner. The midwives at the clinic were very interested to hear how Ghanaian practice was different to at home in the UK, and were all intrigued to hear about water birth and active birth. In Ghana, women are expected to labour lying on their side and in silence. 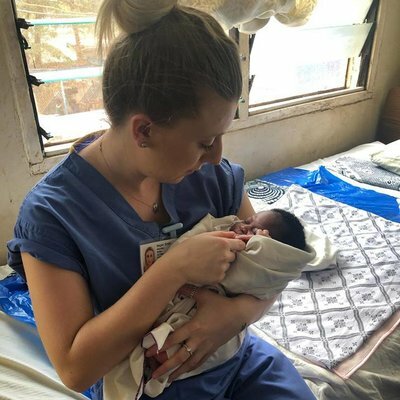 I witnessed many women being sternly told off by midwives and other women for making noise - this can be a shock for a trainee from the UK, but it is a cultural aspect of midwifery in Ghana that you do get used to quickly. The clinic midwives, Auntie Rose and Amelia, showed us how they measure gestation using their hands, and we showed them how to use the obstetric wheels we had brought over which they found particularly useful when a woman was carrying twins! I spent the next 3 weeks at the Regional Hospital – a much bigger hospital that is the place of referral for the smaller hospitals and clinics in the area. The maternity services here include pre-conception, pre-marriage testing for sexually transmitted infections such as HIV and syphilis and blood disorders such as sickle cell anaemia, an antenatal ward, 5 bedded labour ward, 2 bedded delivery room, postnatal room for women after normal deliveries, a postnatal ward for post c-section women and very busy antenatal and postnatal clinics every day! Like in the UK, some days the labour ward was very busy, but on some days they would have no women labouring. When this was the case, I would shadow the doctors. Ward rounds were a highlight as it was really interesting to see how different cases were treated and how limited resources and funding - combined with the type of medical insurance the woman had - affected the care and medicines that could be provided. The doctors and midwives were always willing to answer questions and discuss care and would often ask my opinion and would want to know if a case would be managed differently at home. I also observed one of the doctors performing a D&C on the gynae ward – women received pethidine for pain relief but I was told this is not always the case. I observed around 10 births at here – the midwives are definitely more hands on during deliveries than at home! 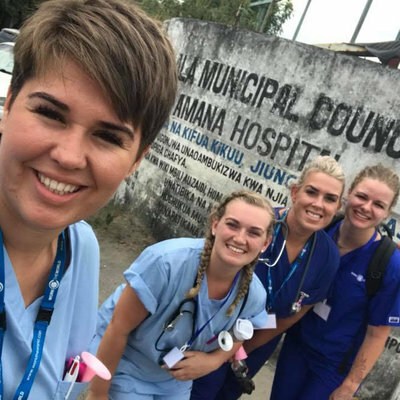 All women had an active third stage and were given misoprostal – the midwives were very aware of the risks of a PPH and worked hard to prevent this happening. I also witnessed a few caesareans. The surgical team was slightly bigger than at Jemima, and the theatre was a more familiar set up, with more advanced technology than at the clinic. The doctors were always willing to have you observe in theatre, and in one case one of the medical students Adam, got to assist with a caesarean. I also witnessed many babies being resuscitated by midwives and NICU nurses. I spent my final week living in Abura village with the Kombets – Mr Kombet, his wife Comfort, and their 4 children: Francis, Obed, Dominica and Claudia. I worked in the village clinic with a great team of community health nurses who were very welcoming and full of questions! Water in Abura is collected from the pump near Mr Kombet’s house, so the clinic does not have access to running water. There is electricity in the village, but power cuts were a daily occurrence! The nearest hospital is in Axim which is about 1 hour away by taxi. The clinic was far more basic, with no electrical equipment, and less staff. As well as giving maternity care, the nurses would see general health cases, and ran a ‘family planning’ clinic where women could come for the contraceptive injection. As I had seen in my other placements, the antenatal clinic here was busy, with women coming from all over the local area for antenatal checks. Postnatal clinics were at the end of the weeks – I loved seeing the babies being weighed in their own little canvas bags hung off the scales! The first delivery I saw in the village was a young girl who had walked two hours to the clinic in early labour. During her labour I was discussing active birth and ways to keep birth normal with the nurses, and questioned their rational for wanting to put up the ‘water’ to speed up labour (an oxytocin drip). At around 10pm the power cut, (darkness in Ghana is VERY dark!) and despite being told earlier in the day that there was a lantern for this situation, we found it had no batteries, so the baby was born a couple of hours later by the light of the torches on our phones. The power came back as the baby let out its first cry! Life was definitely not all work though! The weekly BBQs were a highlight, especially the week we had a group of drummers and dancers to celebrate one of the student’s birthday, and we often went out for drinks or dinner. We made the most of the weekends and often went travelling to tourist attractions and beach resorts. I went to; Beyin beach resort and Nzulezo – a village built on stilts that’s accessed by boat, forts at Cape Coast and El Mina that were the last destination for African slaves before being shipped to America, and Kakum National Park where we stayed in a tree house in the rainforest for a night and walked across the heart-stopping treetop canopies in the morning. I went to a local orphanage one afternoon, and to a hostel called Big Millie’s Back Yard on my last night which had live reggae music until the early hours of the morning. When I was staying in the village one of the nurses, Sister Helena, took me to her hometown of Princess town and introduced me to her family. I stayed in Takoradi for a couple of my weekends too, spending time with the local families and children who lived near us, going to church with Joe, and exploring inside Market Circle – the outside is busy, but the inside is a maze of little alleys and stalls that you can get lost in within minutes! I had an incredible time on my elective, I definitely wasn’t ready to come home and I would go back in a heartbeat! Ghanaians are always smiling – everyone says hello and you always hear ‘obruni’ called after you, the children were always waiting to play or to sit and talk, the midwives and doctors were welcoming and included me in everything, and the Work the World team were more like family. I miss Ophelia’s cooking SO much! I learnt a lot about midwifery and childbirth in Ghana, physically, practically and culturally. It was a great confidence boost as I began my final year - discussing care with the doctors, midwives, and other students, and having to justify my opinions and answer questions with my own knowledge rather than relying on my mentors, made me realise how much I know. I feel I really learnt what it was to be an advocate for women – I got the chance to question plans of care for women if I didn’t feel it was right or didn’t understand why something was being done and suggest alternatives. When justifying the care I was suggesting, I had to consider why I do what I do. Being constantly critical of my care is something that definitely improved my practice. Although the level of English in Ghana is good, and the doctors and midwives all speak it very well, not all of the women do. I was reminded that actually, you need very few words to help a woman through labour (although being able to explain verbally to a woman what position to move into is much more dignified than having to jump on the bed next to her and act it out!) and that with just a few words, touch, and your presence, a woman can feel safe and cared for. I was reminded how strong women are and how brilliant the human body is plus I got to make great friends and amazing memories along the way. Thanks to all the Work the World staff who organised my placements, and to the Iolanthe Midwifery Trust (in association with MIDIRs) for a grant that financially enabled me to make the most of this experience.